Australians love spending time outdoors. So it follows, that the arrival of summer naturally means more outdoor entertaining. Although creating the ideal outdoor entertainment zone may seem daunting, you can turn any outdoor space into a sophisticated outdoor room that’s both functional and beautiful. Regardless of your budget, a combination of a well planned layout, cohesive colour palette, together with the right selection of outdoor appliances will provide countless hours of enjoyment. In this month’s B&C Journal using 6 practical tips, we’ll show you how to create an outdoor kitchen that will make entertaining outside a breeze. Determine the type of outdoor kitchen you will need. A simple outdoor BBQ area for small gatherings or a large culinary outdoor kitchen for larger events? Ask yourself how often you entertain? 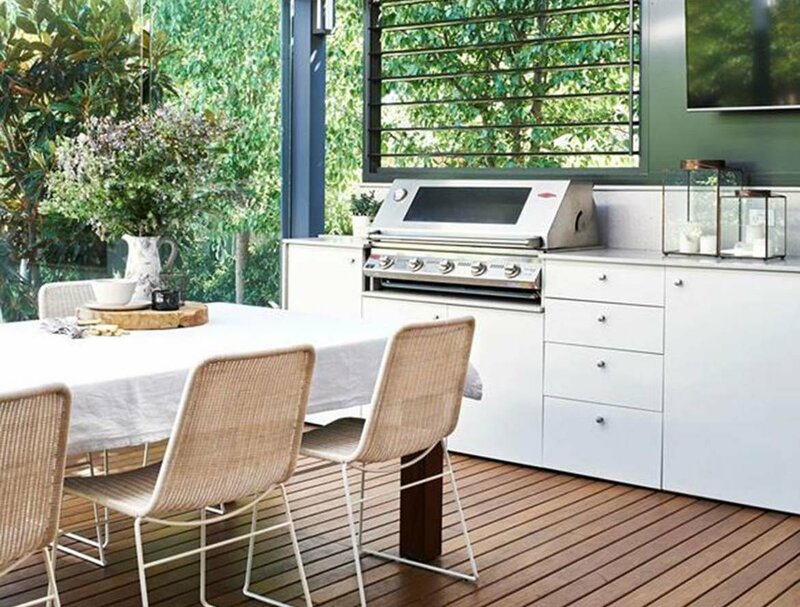 Do you enjoy cooking and like to create more elaborate meals or are you just wanting an outdoor kitchen where you can throw a ‘few snags on the barbie”. It’s important to ask yourself these questions in order for your kitchen designer to determine the appropriate size, storage required, work space requirements as well as ensuring your outdoor kitchen remains proportional to remaining outdoor zones eg dining and lounging. Whatever the case Balnei & Colina can design an outdoor kitchen to suit your specific needs and taste. An advantage to opting for an outdoor kitchen is that you can supplement or at times even replace the need for indoor kitchen appliances. Barbecues are the first and obvious choice, but you can also include outdoor pizza ovens, rotisseries, smokers, wok burners and even teppanyaki plates. Including a sink and outdoor fridge will also make entertaining easier, removing the need to access the indoors if cool drinks and a sink to wash up in are on hand. Opt for appliances that suit your level of cooking expertise and routine. Do not invest in appliances that are not going to be used on a regular basis. A good way to ensure you maximise the use of your outdoor area is to shelter it from the elements. Items like simple patio heaters, heating lamps, column (strip) heaters or even an outdoor fireplace, can help you make use of the space during cooler months of the year. Design tip: Locating your outdoor kitchen is just as important as ensuring maximum use throughout the year. A location that is within easy access of your indoor kitchen is preferable, and also minimises plumbing and electrical installation costs. If proximity to your indoor kitchen is not an option, perhaps revising the scope of works so that your outdoor kitchen operates independently from your indoor kitchen is appropriate, providing you have the budget. By creating a look for your outdoor kitchen that matches well with internal elements of your home will ensure a seamless transition from indoors to out. At Balnei & Colina we always encourage the use of similar design elements in every room of the home to ensure a cohesive look. Your outdoor kitchen and living are no different, so carry your style outdoors by repeating simple finishes like cabinetry profile and colours for a more consistent look. Task lighting is essential for outdoor cooking. Opt for directional lighting in the cooking and preparation zones of your outdoor kitchen and dedicate mood lighting to other living areas within your outdoor room like dining and lounge. Your Balnei & Colina design expert will help create a lighting plan for your outdoor kitchen to ensure maximum functionality when cooking. Using quality finishes for your outdoor kitchen is imperative. Because your outdoor kitchen will be exposed to the elements, selecting the right construction materials for durability is essential to constructing an outdoor kitchen that will withstand regular and long term use. Hardwearing materials will also keep maintenance to a minimum. Balnei & Colina can design and build an outdoor kitchen where all cabinetry and benches are weather-resistant ensuring the longevity of your outdoor kitchen. Design Tip: Opt for grease proof materials with a smooth surface that are stain resistant for outdoor benchtops. Still unsure how to create an outdoor kitchen that’s perfect for entertaining? Leave it to the experts at Balnei & Colina. 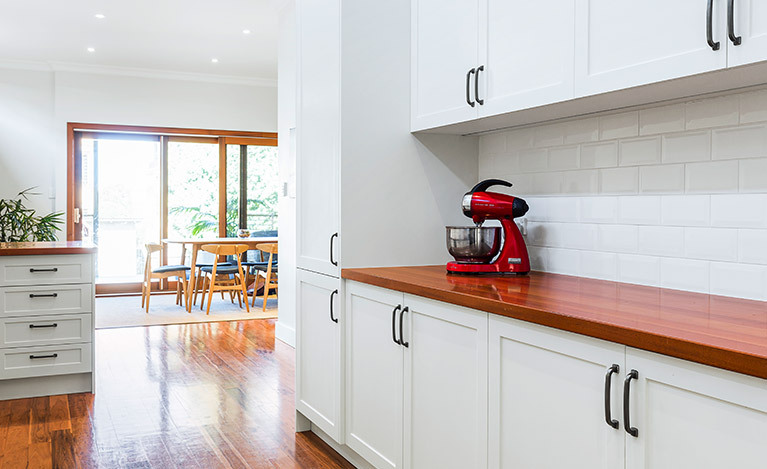 Simply book a design consultation with a Balnei & Colina expert today on 1300 450 320, drop us an email info@balneiandcolina.com.au, visit us at balneiandcolina.com.au or connect with us via Facebook or Instagram to stay up to date with the latest kitchen and design trends.